I’ve been tagged? By the “161 meme” book doojiggy. My colleague Steve (www.stephendanko.com) did it. The idea is to get friends and colleagues to respond with the 6th sentence on page 161 of the current book they are reading. A little explanation usually helps! By the time I caught up to Steve’s message, it fit nicely with my toying around for a blog article on the kinds of non-trade literature genealogists like to read, especially novels. While I also have two or three books on the go at once, I chose A Russian Diary by Anna Politkovskaya. Page 161, sentence 6: “They say it is a small victory for us.” This is a quote from government apologist Ella Pamfilova in September 2004, Chairperson of Putin’s (then) newly created Presidential Commission on Human Rights. Ella sees it as a another victory for “the benign nature and democratic credentials” of Vladimir Putin. She reports support from all regions for this move. Cynical journalist Anna sees the commission as an action to control the human rights movement in Russia, which Putin considers his real opposition. Putin had already marginalized political opposition in elections by restricting the registration of other parties and removing the people’s right to vote for individual candidates. 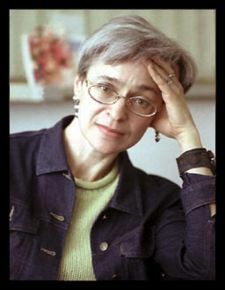 An outspoken advocate for democracy and human rights, Anna was murdered in the stairwell of her Moscow apartment building in 2006. Her friend Alexander Litvinenko, a former FSB agent in exile in London who had urged her to flee death threats in Russia, accused the FSB of assassination. Anna was one of several free-speaking Russian journalists who have been mysteriously killed. Not long after, Litvinenko himself died from radiation poisoning placed in his teacup. Now I wonder what these people are reading: AWCH, CDM, John Reid, Mary Anne, and Elayne. You know who you are. Just send your comment here. St. Petersburg before the turn of the twentieth century was one of the greatest cities (THE greatest in some opinions) of Europe. It was a magnet for European intellectuals and artists and bons vivants. That’s where grandma Marija Jurikas headed to find gainful employment and perhaps adventure. She might demur if I described her as a small, stubborn woman. But when middle class women were supposed to stay at home, marry well, and demonstrate domestic virtues, Marija left the family home in rural Latvia with her skills and a longing to see and be part of something new. In 2006 I saw where Marija lived in St. Petersburg. 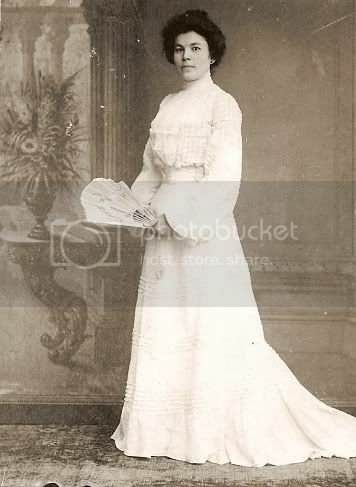 She was employed by Baron Kusov as the family seamstress and dressmaker.A 1910 city directory described Vladimir Alexeyevich Kusov as a state councillor, a technical director of the Mariinsky Theatre, treasurer of the Emperor’s Russian theatre society, and a sponsor of St. Alexander Nevsky church. His mansion is on the boulevard embankment of the Neva River on Vasilievsky Island. Marija designed and made the fashionable dresses for Kusov’s wife and daughters. With a seat at the head butler’s table for meals, she had high ranking in the domestic pecking order. A short carriage ride would take Marija to the Mariinsky for some of the continent’s most exciting operas and ballets. All of Kusov’s household were able to take advantage of regular seating in the famed, fairytale theatre because of his position there. The Mariinsky was built in 1860 and became Russia’s premier showcase for music and performance. During Soviet times it was known as the Kirov Theatre. Marija was born in 1872 in Lade parish near the town of Limbazi. Limbazi is just east of Latvia’s northern Gulf of Riga coast. We don’t know how or where she was trained, but her workmanship was exquisite. It included not only dressmaking and designing, but related details like embroidery, smocking, crochet, tatting, knitting, and other hand crafts. She was probably in Petersburg in the 1890s and early 1900s. However, she migrated to Switzerland at some point, before embarking to visit her brothers in Canada in 1908, at the age of 36. The ship’s manifest said she was 32. It’s a bit of a mystery why she hadn’t married by that time, but brothers Janis and Paul remedied that. They knew a handsome young Latvian man in Port Arthur, Ontario, an excellent candidate. They decided to marry in 1912. Now I know why my mother was an only child. Even though Marija’s age kept slipping downwards in various documents, typically for a woman of her time, she was 41 when she gave birth. Marija’s handiwork and sense of fashion never ended, even in a Canadian “outpost.” She always wore the garnet earrings which were a gift from the Kusov family. Oh how I longed for the European sophistication of pierced ears, as a child! To her daughter’s dismay, she crafted her clothing by the latest Parisian styles, to the general ridicule of her conventional small-town classmates. Exquisite details were worked into the tiny dresses for grandchildren. Many of them survive, including a christening gown. She made me several dolls, the like of which I’ve never seen since. You turned the beautifully dressed doll upside down and a second doll appeared in a completely different outfit. The voluminous skirts hid the surprise. Surely the next time I'm in St. Petersburg the ballet season will be on. White Nights! Dia de los Muertos came and went without much ado in this corner of downtown Toronto. Little Halloween ghosties demanding trick or treat are scarce in urban high rise buildings. Is this the best we can do to remember an ancient holiday (holy day)? In Mexico, the first two days of November (a.k.a. All Saints Day and All Souls Day in similar religious calendars) are marked with many traditions to honour the deceased. Foremost among them is the customary trek to the local cemetery to tend family monuments which may need weeding and paint and colourful paper decorations, but especially new flowers be they fresh or artificial. The exercise is in the nature of a family (and community) picnic. Depending on the locale, celebratory masses are not unusual. Nor are candlelight vigils, processions, a love for song, and perhaps fireworks displays. How slightly dull and ancestrally-disinterested we North Americans seem in comparison.